I finally was able to start using my drawing tablet last month, and while I believe I have loads of room for improvement, I've been making great progress. This is my latest experiment. It's supposed to be for a new avatar for me to use here on the TP. It was a little rushed , so there's a few things I'm not happy with (I wanted to start using it a.s.a.p., hehe). 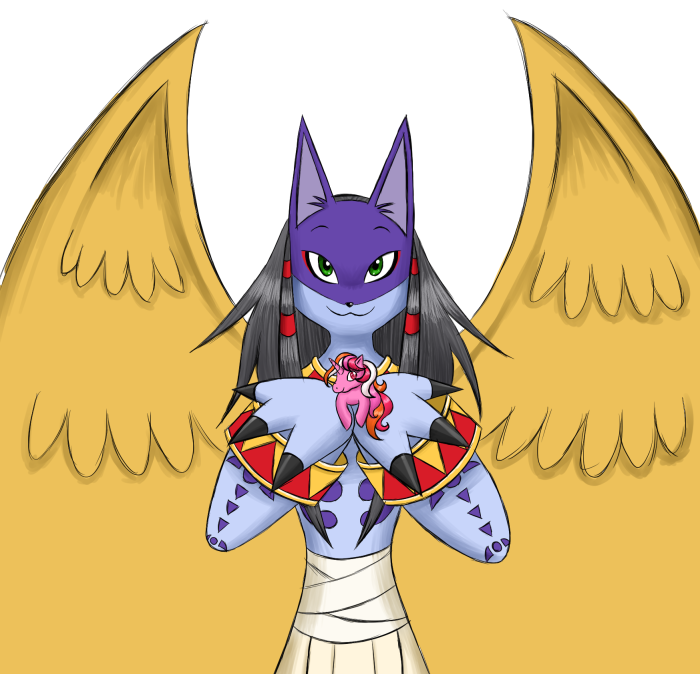 It's the Digimon in my current avatar, Anubimon, holding Galaxy, the first G1 pony I ever got. I already made the version that would be the actual avatar, which was a source of endless frustration. Even aver running it through multiple image compressors, losing about 80% of the quality, and reaching barely 6-8.5k, the system still says it's too heavy to use. I'll probably make a thread in Non-Pony Artwork if anyone's interested to see my other experiments.